Download a game on the Xbox 360 or the Wii and you're good to go. You can play it. 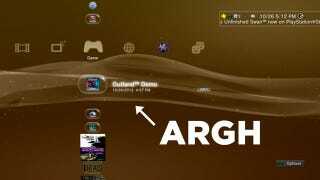 Download a game on the PS3 and you just might have to then tell the PS3 to install it. You have to manually install any game that you have downloaded in the background. This is strange, sort of like the PS3 is getting back at you for being an efficient multi-tasker. By allowing background downloading, the PS3 is respecting your time and not forcing you to sit through a download. But by requiring you to find the bubble icon that represents the game you just downloaded, click it and install the game, it's just finding a different way to hassle you. Why do I need to tell the PS3 I want to install the game? What else does this system think I want to do with the game I just downloaded?? This wouldn't be so annoying if installing a decent sized game on the PS3 didn't take a couple of minutes—and block the PS3 from doing anything else while the installation is happening. Ugh. Why does this requirement exist? I never remember to ask Sony people, but I have a theory: you probably have to install background-downloaded games manually because the installation process takes over the PS3 when it starts. As annoying as the installation process is, it would be worse if it kicked in and took over the PS3 while the person operating the PS3 was using the system for something else. Hey, your background-download is done! We're installing the game now, so you just sit tight and don't mind the long interruption! This post was part of Anger Management, the label we give for all of our belly-aching and some of yours. Anger Management stories run on Friday evenings, mostly.